In terms of student participation, the Bord Gáis Energy Student Theatre Awards, which have only been running for two years, are now bigger than the BT Young Scientist Exhibition, which has been running for half a century. This year, the partnership has won the Best Use of Creativity in the Community Award at the Allianz Business to Arts Awards. After successfully running a pilot competition in 2013, Bord Gáis Energy launched the event nationally last year with a prize fund of €10,000 and awards in 11 categories attracting 3,300 entries. 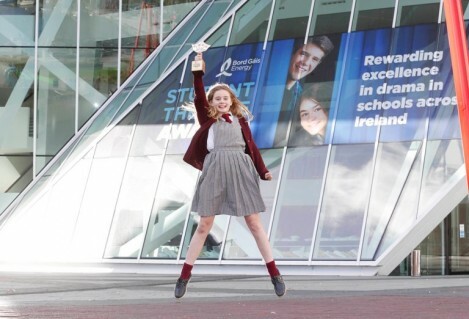 Some 57 finalist schools from across the country were invited to bring 2,000 students to the Bord Gáis Energy Theatre for an Oscars-style awards ceremony. Some competition entries were co-productions staged by neighbouring boys’ and girls’ schools; some schools had more than one entry, with a production each from their junior and senior cycles. Grants were given to help cover the cost of transport to the awards ceremony and each student was given lunch on the day. This year, the event is being expanded so that students’ parents can also come along. “This event would not happen without Bord Gáis Energy’s involvement,” says Stephen Faloon, general manager of the Bord Gáis Energy Theatre. “The energy within the theatre on the day of the awards was electric. There were people on that stage whom I have no doubt will be stars of the future. For example, there was a Waterford production where there was one girl among 40 dancers on stage and all eyes were on her. She could have been on stage in the West End. “We picked the winners by spending a week watching DVDs that had been submitted by the schools; it was one of the most intense working weeks of my life,” adds Faloon. Bord Gáis Energy communications manager Irene Gowing says the student awards were a way of building on the value of the company’s title sponsorship of Ireland’s biggest theatre. The partners are trying to get as many schools as possible involved. They don’t need to stage a whole play, they might write or rehearse just a scene. The awards also go beyond concentrating on front-of-house, they recognise the people behind the scenes in costume and set design.